The Waldorf curriculum strives to follow child development in terms of the academic curriculum as well as the Physical Education Program. In the early years, healthy movement is fully integrated into the Morning Garden and Kindergarten day through outdoor play, indoor play, circle games, imaginative play, time in nature, walks around the neighbourhood and park, and purposeful work. In Grades 1 through 4, physical education is taught through various games to help develop spatial awareness. Physical activity, incorporating both gross and fine motor activity, is emphasized through games using imagery, story, rhythm and imitation. The Waldorf games curriculum nurtures the joy of physical movement as well as coordination and movement skills in the early grades, which will help children if and when they decide to play organized sports. The games program teaches the students to play with each other before they play against each other, to acknowledge each other, to play safely, and to gain an appreciation for all kinds of movement. ​​In Grades 5 and 6, there is a focus on the nobility of sport, on the beauty and form of physical movement, which mirrors the academic curricular emphasis upon ancient Greece. This culminates with students’ participation in the Greek Games in the sport of javelin, discus, long-jump, wrestling and running. In Grades 7 and 8, team sports like soccer, volleyball, and basketball and their associated skills are introduced in the physical education curriculum. By this time, the children have developed strong sensory integration, real respect for rules, and an understanding of how a team works together. For this reason, they are able to develop self-discipline and a healthy sense of competition. In these years, students also begin to consciously work toward developing a balance in their lives that incorporates a healthy level of fitness. 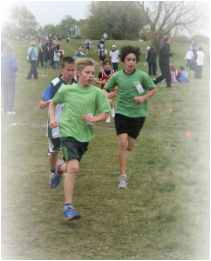 We strive to join the local cross country meet with an emphasis on training together. ​Our goal is to develop skills for a lifetime of physical activity, abiding appreciation for the outdoors, and striving to joyfully meet and overcome life’s challenges.